Please click here to sell your Benjamin C. Brown painting or receive a free art evaluation of your piece. Click to review some of the paintings we've recently purchased by Benjamin C. Brown. Benjamin Brown was a landscape painter and printmaker, known for his Impressionist landscapes of the Sierra Nevada Mountains and fields of poppies. His primary mediums were oil, lithography and etching, although he also did watercolor painting throughout his career. Brown was educated at the University of Tennessee and at the St. Louis School of Fine Arts with Paul Harney and John Fry. His early interest was photography. In 1890, accompanied by friend William Griffith, he went to Paris for a year of study with Jean Paul Laurens and Benjamin Constant at the Academy Julian. Returning to the United States, he lived in St. Louis, Little Rock, Arkansas, and Texas. His early specialities were portraiture and still lifes, but moving to Pasadena in 1896, he turned to local landscape and also painted the Grand Canyon and the Painted Desert in Arizona. In 1914, he began doing etchings, and with his brother, Howell, co-founded the Printmakers of Los Angeles, later known as the California Society of Printmakers. Exhibition venues included the Seattle Exposition in 1909 and the 1915 Panama-Pacific Exposition. 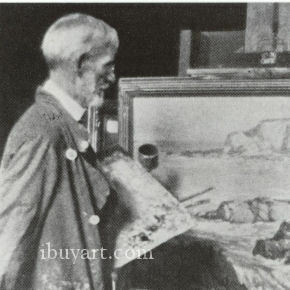 He was a member of the California Art Club and the Pasadena Society of Artists.